The views south of Ridgeway are considered to be some of Colorado’s most captivating scenes. Mt Sneffels, Dallas Peak, and their neighbors rise in a spectacular fashion from the Uncompahgre valley below. Large, scenic ranches line the northern slopes of the Sneffels range, but higher up some of the peaks have received wilderness protection. The Mt. Sneffels wilderness contains Mt. Sneffels (14,150 ft.) and the surrounding mountains to the west. At 16,566 acres, the Sneffels wilderness ranks as one of the smallest wilderness areas of Colorado. The Sneffels range is a subrange of the San Juan mountains, located on its northwest perimeter. The Sneffels are composed of igneous volcanic rock that form forbidding steep sided cliffs and pinnacles the give rise to jagged peaks and ridges. Much, if not all of the wilderness is high altitude, rugged terrain surrounded by steep subalpine forested slopes at the lower elevations. The view of Mt. Sneffels from Ridgway and the Dallas Divide region is considered one of Colorado’s classic landscapes. Each fall, photographers attempt to capture the brilliant autumn aspen foliage with the San Juan mountains as a backdrop. To visit the area, drive highway 550 south of Montrose to the small town of Ridgway. In Ridgway, take hwy 62 west (towards Telluride). The Sneffel range will appear to the south all along the route. The Sneffels Wilderness trails are usually snow free by mid-July. Heavy, afternoon rains are common in the months of July and August. Blue Lakes / Blue Lakes Pass – Enjoy scenic alpine views of Yankee Boy Basin and the surrounding peaks on this strenuous hike over Blue Lakes Pass to the Blue Lakes. Yankee Boy Basin is well known for its abundant wildflowers in late July. Begin the hike from the trailhead at the end of Yankee Boy Basin Road (a 4WD road). The trail ascends a steep, rocky trail to the top of Blue Lakes Pass. The pass offers wonderful views of the surrounding peaks and valleys. From the pass, the lakes can be seen in the distance below. Continue on steep switchbacks down to the lakes. Return the way you came. This hike is very strenuous. Leaving Ouray on US-550, at the first hairpin turn, exit onto Camp Bird Road #361. After 4.5 miles, slight right onto USFS 831.1B Yankee Boy Basin Road. To this point, the road is passable in passenger vehicles. You may opt to hike from here, or if you are in a high-clearance 4WD vehicle, continue another 4.6 miles over a steep and rugged jeep trail with tight hairpin turns to the trail head. 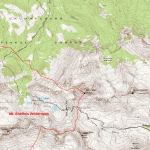 Map #141, Telluride, Silverton, Ouray, Lake City, Colorado of the Trails Illustrated series is an excellent guide map that shows the jeep trails as well as the hiking trails in the area. Uncompahgre Wilderness, Weminuche Wilderness, Lizard Head Wilderness. For more wilderness areas visit the Colorado Wilderness areas page.